Best Disney Cruise Packages - Land and Sea! Best Disney Cruise Packages – Land and Sea! When you experience a Disney cruise you are transported into a world of magic, where anything is possible and dreams really do come true. In addition to their cruises to far off places and adventure, Disney cruise packages are available on land and at sea to make your vacation something to remember. 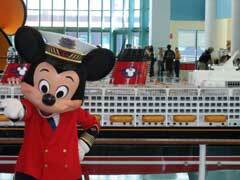 Packages for land and sea are called Adventures by Disney and can be added to either the Disney wonder cruise ship’s 7-night cruise to Alaska or any one of three Mediterranean cruises for 2013. In the Alaska Disney cruise Packages, you are taken by Disney employed guides who are knowledgeable and experienced in giving you all there is to offer at your destination. The activities include panning for gold in Skagway, a seaplane tour in Juneau, totem pole carving in Ketchikan and a salmon bake at Taku glacier. These are offered exclusively on the 7 night Alaska Wonder cruise that goes roundtrip from Seattle. On a Disney cruise to Europe, the experiences can be part of a pre-stay or part of your actual cruise. For example, on the 8 day Mediterranean Magic experience, you can visit Prince Monaco’s castle, make gelato in Florence, take a private boat tour to Capri, and take in all the famous sights of Rome, including the Coliseum, Trevi Fountain, the Spanish steps, the Sistine Chapel and the Forum. With Mediterranean cruise deals that include Greece on 12 night adventures, you can also participate in a mini marathon at the original Olympic stadium, take a Greek cooking class in Mykonos or swim at Gozo as part of Disney cruise packages. Once again, Disney has thought of everything, taking a cruise to a whole new level to become an adventure the whole family can enjoy and making sure that guests are given the VIP treatment throughout, avoiding the lines, avoiding the crowds and having a ball. They have also gone one better in shore excursions, making them an extension of the cruise so you can trust that the experience will be pure Disney. Disney cruise specials and all the attached magic are just a click away. For cheap Disney cruises, check online or with your travel agent, and remember, these cruises fill up quickly so book well in advance and make sure you inquire about the Disney Cruise packages for fun on land and sea that are available on your sailing.